PrimeCare, Inc. provides daily transportation services for individuals to their places of employment, day programs, community activities and recreation. 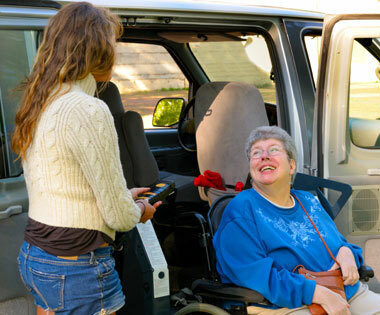 We offer comfortable and appropriate transportation for individuals primarily in vans, some of which are specially adapted for wheelchairs. PrimeCare, Inc. employs drivers who are courteous and friendly, and who meet extensive qualification requirements based on their personal driving records. Drivers are all trained in CPR and First Aid. Drivers of larger vehicles also possess Public Service Licenses. Our drivers are experienced in working with individuals with all disabilities and provide assistance to individuals who are ambulatory, as well as those who use a wheelchair for transportation. For emergency situations all staff have access to cell phones.